Our first Robotic Kiosk, nicknamed RoboTotem, which adds exciting extended functionality to our range. The I-Touch Totem 2 XL is the first kiosk in our range to have a robotic arm installed, making it capable of many complicated automation tasks. It is able to store, hold and dispense a wide range of items. 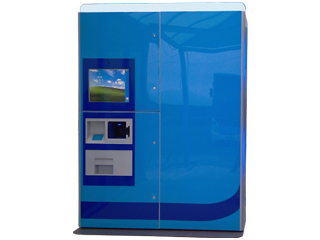 This unit is not only the first robotic kiosk we have made, it is also the biggest production unit to date, standing at 2.2 meters tall by 1.6 meters wide, this unit has presence and extreme fleixibility in functionality. This, when coupled with the robotic arm, means that this unit is suitable for a vast range of applications.